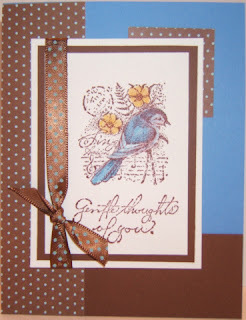 If you remember, I participated in a sketch challenge posted by Sara on her Deperate Stamper blog. 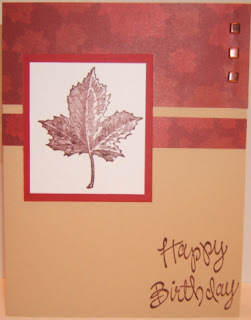 She is posting 27 card sketches in 27 days. I loved the idea and made sure I started these challenges. I sort of fizzled out after the first one. I had every intention of participating as she posted each sketch. Needless to say, it didn't happen. 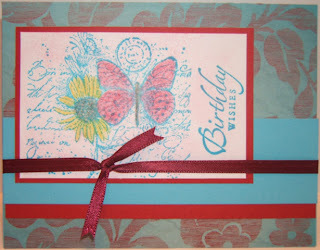 Today I knew I was going to have lots of time to stamp and I started with Sara's sketches. I printed them all out as a sort of map for my card making today. I picked out the papers I was going to use and then started putting things together. I had sooo much fun. I felt so creative today. I used her sketches as a starting point and everything else just came together. I didn't make a card for all of her sketches today but I did manage a few. Without further ado, here they are. 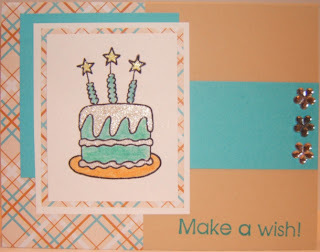 Great cards Kathi! My, you have been busy! Thanks for sharing these with me and playing along! !